Such is the array of equipment available these days that by the time you'd returned from the kitchen suppliers, you wouldn't have any money to buy food to cook with it. Exaggeration? Well, perhaps a touch melodramatic, but now that the celebrity chefs have got in on the act, you can seriously have no change from £100 for even just one pan.The bottom line is, buy the best you can afford. In the case of the average pasta dish, you are going to need two pans. The first is a high sided stainless steel stockpot for boiling the pasta. In terms of capacity, aim for one that holds no less than 16 litres of water because pasta performs much better when it has plenty of space to move around. The depth is equally important because any pasta above the surface will not cook. Some models of pot are supplied with a removable liner that does the same job as a colander, allowing the cooked pasta to be lifted out and strained without the need for transferring a pot full of boiling water from the hob to the sink. For the sauce, a wide shallow pan called a skillet is ideal as the relatively large surface area allows for a more even distribution of heat through the sauce during the cooking process. If it is a long, string-like pasta you are using, such as spaghetti or linguine, or one of the ribbon varieties, for example fettuccine, ensure that you have a pasta fork to hand. Some models are manufactured from plastic but the best are stainless steel, featuring a long hollowed-out handle with a concave head and shallow, wide teeth that allow the strings or ribbons to be easily lifted from the pan both before and after tossing in the sauce. 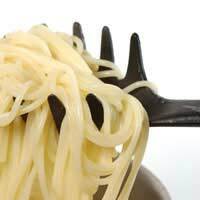 Tubular and other more manageable shaped pastas can be handled using a slotted spoon with a wide shallow head. The addition of grating cheese while in the pan or once the pasta is presented at the table can be achieved either by using a standard flat kitchen grater or one of the three-piece barrel graters that have become widely available outside of Italy in the past 10 years. Manufactured with a plastic casing, they allow the cheese to be pushed against the teeth of the grater using one hand while turning the handle that operates the metal barrel with the other. A drawer at the bottom of the unit is then slid back to release whatever amount of cheese is desired. In the UK these graters retail for around £10. For string or ribbon pasta, all that's needed now is a fork and spoon, the latter used as support for winding the strands around the fork before eating. The spoon is, of course, optional but it can be useful at dinner parties in preventing nasty slurping noises and the unappetising sight of a strand of spaghetti hanging from the mouth of a diner in a less than dignified manner. Alternatively, hand out some large napkins that can be tucked down the front of a shirt - those tomato stains can be a devil to try and wash out. Should Grated Cheese Always Follow Pasta?